My name is Jennifer Mills-Knutsen. 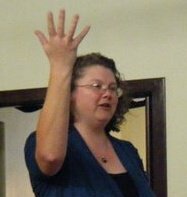 I am the solo pastor of a small but vital and thriving congregation in the United Church of Christ, where I have served since 2005. I currently reside on the borderline between the South and Mid-West, but I have moved from coast to coast and north to south in my adult life. I am mother of a young child, and I am married to an aspiring academic and curmudgeon. I live by faith, intuition and intellect. I follow politics, football and the Boston Red Sox. I like to talk about progressive issues, theological concerns, church life, the impact of technology and media, pop culture and books. I write because it helps me to reflect on the world and brings me into connection with God. Welcome to my blog–thanks for stopping by! You may contact me directly at jmillsknutsen (at) gmail (dot) com. Wow. If I could find a pastor like you (not much chance of that happening here in Marion County, Florida — and the political ambiance down here has been a real culture shock for this Jersey Girl) this lapsed Catholic might go back to church. Too bad you’re a Red Sox fan (I’m just sayin’). Just wanted to share how very much I appreciated your article in Common Lot about chasing down your running son. Exactly perfect. Thank you. Thank you so much, Elane! I’m honored that you would reach out and respond. That piece was originally shared here, but this little blog has been much neglected in the last few months thanks to some other opportunities to publish elsewhere. Tune in this summer as I hope to get back in the swing of things! Very impressed with your coments about God and the way so many try to assign roles for him. Good job. Loved your ideas and the way you communicated it to us. My name is Kevin Gillespie, Pleased to meet you. :).